How to Tell if You Have Allergies or a Cold? There is a lot of incredible overlap between the manifested symptoms of just a common cold and the symptoms of an allergy. 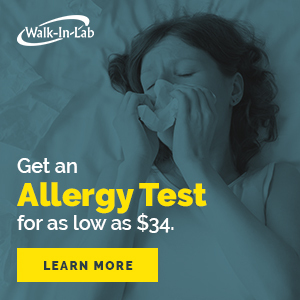 Many people go through their entire lives without getting allergies tested and just go on under the assumption that they have a chronic cold. Every time you get some nasal congestion or soreness of throat, your first reaction may be that of it being cold. A lot of people with allergies go under these assumptions and try to treat allergic symptoms with cold and flu medication, which obviously doesn’t work to relieve or aid in bettering the allergies. Colds and allergies appear very similar in their symptoms. The similar symptoms include a runny nose, watery eyes, coughing, and sneezing etc. However, there are some symptoms in which they differ from each other as well. For starters, colds usually occur during the winter season whereas allergies remain persistently throughout the year. Cold symptoms manifest themselves later but allergy symptoms show up immediately after exposure to an allergen. Body aches are a symptom of just a cold. A stark difference between them is that the cold usually gets accompanied by a fever but allergies never include fevers as symptoms. Another main and defining the difference is the duration of both these conditions. Cold symptoms will last you at the most up to 2 weeks and no longer than that. The symptoms of an allergy, however, can last for much longer than that duration and are most persistent. Do I Have a Cold or an Allergy? You can easily find out if you have an allergy or cold by looking at the differences discussed above. Another way to know is how long you’ve had the symptoms. If they last longer than 2 weeks then you may have to consult a doctor and get some allergy tests done as it may be cold. So, it is important to look at both the duration and the frequency of the symptoms. Catching a cold is a very dreadful and painful thing, especially in the more cold months of the year. As awful as having a cold is, there is no permanent cure or any cure for that matter for the common cold. This is because the cold is a viral infection and it changes its strain very rapidly. The strains of the cold change too rapidly for scientists to be able to create a permanent vaccine for it. Because of this reason, the medication available is mostly targeted towards managing the symptoms. The treatment includes things like paracetamols and painkillers, cough syrup, nasal decongestants, pills for multiple symptoms, etc. Consult your doctor before using any medicines. There are lots of home-based solutions for handling it as well, such as inhaling steam, drinking plenty of fluids, and keeping yourself in an area in more moist and humid air.